Creating a blog is a different thing, but taking that blog to achieve the greatest heights of success is totally a different thing. If you’re interested in writing your own blog and generating money through it, you can follow this tutorial on how to start your own blog. All you need is an idea! Once you have an idea, you can use it to nourish your blog and convert it into a successful source of income. However, earning money shouldn’t be your only goal. The first step in starting a blog is choosing a topic. A topic is the foundation of your blog. Your blog will be recognized by your topic name. So choose your topic wisely. Although people get confused while choosing a topic, the best way to choose a topic that you won’t get bored writing about and will always have new ideas about is the one you are interested in. Pick a topic that suits your interests and carry it with you along your way to success. You can choose any topic you like and it is not necessary to choose one from the list above. Your topic can be entirely different from these. One thing that you should keep in mind is that you should be interested in writing about that topic. In this way, you won’t run out of ideas. It is also not necessary for you to stick around only one topic for the rest of your life. If you’re interested in more than one topic, you can pick that one too and start a new blog with that one. It’s that easy. The next step after choosing a topic is to choose a domain name. Domain names are identifiers for your website. People access your website through your domain name. Therefore, it must be a meaningful one and should be relevant to your main topic. Although domain names are mostly preoccupied due to the vastness of the internet, you can always look for domain names with different extensions such as .uk, .pk, .co, etc. Always choose a name relevant to your topic. If it is about cars, choose a name that is relevant to cars such as, ‘Automombile.com’. Your domain name shouldn’t be too much matching to an existing domain. If that is the case, people might mistype the other domain name for yours and your traffic might be directed to the other domain. Keep it simple. A domain name that is both; pronounceable and easy to spell. Avoid the use of numbers and hyphens at all costs, they make it difficult to type the domain. The domain name should be short as long names require more focus to type. Your domain name should make sense to both; the public and Google. After you have chosen your domain name, you have to purchase it. A normal domain costs around $10/year. However, there are expensive ones out there too. Once you’re done buying your domain, it’s time for hosting it. Through web hosting, your site becomes accessible to the public. If your website isn’t being hosted, it can’t be seen by anyone on the internet. 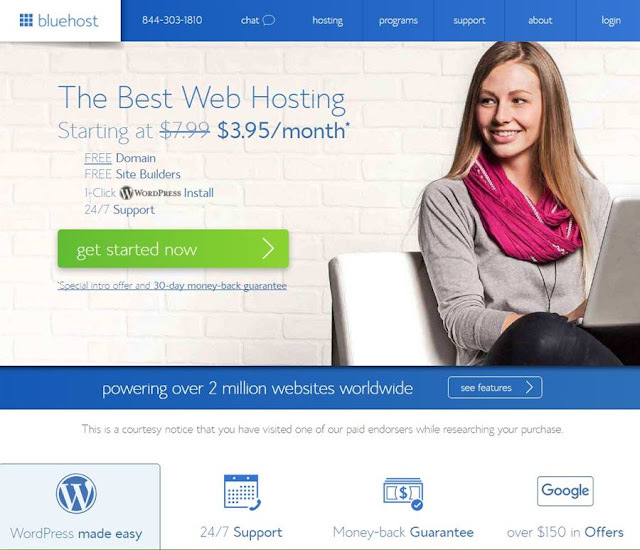 Bluehost offers prices as low as $3.9/month. A service that cheap is very good for starters. Once your blog reaches a high traffic stage, you can upgrade your package on Bluehost without jumping to some other hosting service providers. Blogging software or blogging platform is where the action happens. From here, you publish your posts to the general public and interact with them. There are a number of free blogging platforms out there. However, you should host your own as it gives you all the rights of administration. Not having full control over the content. Free platforms can shut your blog down at any time with or without any reason. Free platforms have domain names longer than a usual web address. Therefore, it becomes hard to remember them. Generating revenue through ads also becomes a problem as they don’t allow you to place ads on your blog. WordPress here has two versions. Wordpress.org is the version that is available for self-hosting while the other one is for free, online use. 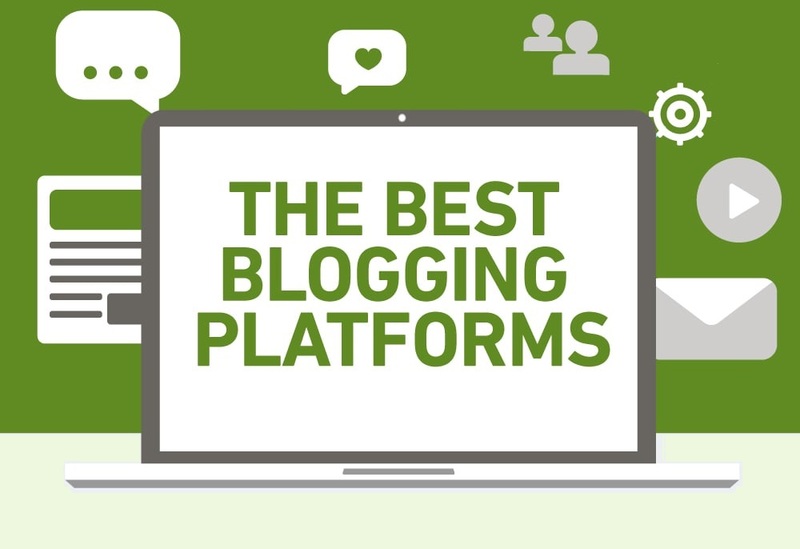 All of these blogging platforms have been described in detail below to help you choose the one that suits your needs. In the end, all you have to do is engage with your audience and satisfy their needs. Once you’ve done this, you will see that your audience will start to increase day by day. WordPress is one of the most used blogging services out there. Around 25% of the websites on the World Wide Web are powered by WordPress. WordPress software can be downloaded from the internet and installed to your website. Some hosting providers also have the option to install WordPress without the need of downloading it from the internet. Setting up WordPress is quite easy and the process usually takes around 30 - 50 minutes depending on which guide you are following. WordPress comes with a range of themes to make your website look different than others. Other than that, you can add plugins and extensions to extend the capabilities of your website. There are more than 42,000 free plugins and extensions in WordPress along with thousands of free and premium themes. People looking to earn money through their blogs. Organizations who want to add a blog to their current web presence. This is the online version of WordPress. In simpler words, WordPress.com doesn’t require you to buy a domain or a hosting service. It is a free (and limited) version of WordPress. All you have to do is signup for WordPress online and start blogging. However, WordPress.com does provide a number of plans for bloggers which include a $0/year plan for basic bloggers. A $99/year plan for professional bloggers and a $299/year plan for advanced business blogging. WordPress.com also comes with a bunch of themes. However, it doesn’t provide as much options as the self-hosted version of WordPress. Bloggers who don’t want to spend money on their blog and do it just for fun. Professional bloggers who don’t care about the presence of a subdomain. One of the oldest blogging platforms; Blogger, is owned by Google. Signing up for the platform is quite easy and all the setup is done by Blogger in a matter of minutes. From there you can start blogging immediately. Much like WordPress.com, you get a subdomain like yourblog.blogspot.com instead of an actual domain. However, you can buy your own domain on Blogger if you wish and the good thing is Blogger provides free unlimited hosting for any custom domains. Tumblr is more like a social platform blog. Tumblr is used by bloggers who want to post short content. This content can be in the form of text, images, or even videos. Just like WordPress.com and Blogger, Tumblr also gives users a subdomain. If you want an actual domain, you’ll have to buy it. Tumblr also provides users with the option to customize their blog. However, most of these customizations are not for free. Medium is a blogging platform for blog posts and articles. Different people share their opinions and stories on the website under their profile name. For example, if you want to post an article, the article will be posted under your profile link, medium.com/yourname. A custom domain can also be linked to your profile but that requires purchasing. Users can up vote and recommend an article which is a great way of promoting an article. The design of the website however, remains the same. The only thing you can change are the images and the typography presented in your profile. Bloggers hoping to construct their authorship as a brand. Also known as the basic version of WordPress, Ghost is a blogging platform that can be hosted. The pro version. This version comes with hosting options and ranges from $8-$200 depending on the number of blogs and traffic generated through them. Like all blogs, you can purchase a custom domain name for Ghost too. Ghost also lets user customize the look and feel of their blog through different free and paid themes. Bloggers who are interested in providing technical solutions. Apart from being a blogging platform, Squarespace provides web hosting along with an online website builder. Subscription plans range from $8-$24/month. These subscriptions include hosting along with a custom domain name. For users who already have a hosting provider, Squarespace allows them to keep that hosting and use it with Squarespace. With a number of designs to choose from, Squarespace has a very user friendly interface. You can also add plugins to extend the functionalities of your blog. Moreover, you can customize the way things are on your blog simply by using a drag and drop editor. Squarespace is used by bloggers who do not have any skills or experience regarding website design. It is also suitable for business owners who need a blog for their business. Wix is quite similar to Squarespace with its own hosting service and site building features. Users are provided with a subdomain and can also purchase a domain of they want to. Subscription prices range from $0-$19/month. Wix offers more than 500 designs to choose from along with other plugins and extensions. Wix is suitable for the same type of bloggers Squarespace is suitable for. Drupal is a fully functional content management system. Unlike other blogging platforms, Drupal is not easy to use. You should only use it if you have knowledge about web development and design. Drupal doesn’t come with its own hosting service or subdomains. Therefore, you have to purchase your own domain and hosting service. After that, you can download Drupal from drupal.org and then set it up on your website. Business owners who are interested in creating a CMS in the future. Joomla is a self-hosted blogging platform much like Wordpress.org. It provides hundreds of templates to choose from. You can design any type of website on Joomla as it is immensely flexible. However, it is also difficult to learn. The first month of your Joomla subscription is free. However, the other months will cost users from $20-$100/month. Joomla is costly and not many people know how to use it. So, support is also limited. Unless you are an experienced web developer who already has a source of income, it is recommended that you choose other options such as WordPress. Joomla Is suited for bloggers who have experience in web development and established business owners. Weebly is an easy to use, blogging and web development platform. Weebly lets you create your own design through simple drag and drop options. Apart from creating your own design, you can choose to apply a theme to your website. Subscription plans range from $8-$500/month. Weebly also lets users to try out the service before they buy it. Typepad is a blogging platform that comes along with its own hosting services. It allows users to create a website from scratch or use one of the existing templates. Typepad is suitable for both, beginner and experienced bloggers. However, there are a few problems. Typepad doesn’t allow external hosting so your blog is hosted by them which doesn’t gives you full control over your blog. Moreover, it becomes difficult to edit your HTML directly. This might not be a problem for beginners but users who want to edit their code might face serious issues. Typepad is suitable for beginners and for bloggers who have a limited approach to coding. Along with blogging, Magento provides users with a content management platform. Magento is mostly used for ecommerce. Magento is not as easy to use as other blogging platforms. You will have to learn how to use it which involves learning how to code. Magento is suitable for skilled web developers and not for beginners. It is also suitable for people who want to start an ecommerce blog. Although there are numerous different blogging software available, you have to choose the one suitable for you. It is up to you to choose your desired blogging platform. However, if you’re a beginner and are not ready to dedicate most of your time to designing your website, WordPress is the most convenient choice for you.